Pans have feelings, you know. Yep, they sure do. And many of you are abusing these defenseless pans without even knowing it. It breaks my heart just thinking about it. See the beaded up water on the pan? Not water – tears of sadness. Or maybe your pans aren’t saying anything because you’re a sane person and don’t hear voices from your pans? Fine – don’t play along. But know this – whether your pans are talking to you and you’re wondering if you’re going crazy, or your pans are silently sitting in your cabinets – they still need love. If the nonstick coating is flaking off into little bits, or you can see silver through the black nonstick coating, it’s time to replace it. This is the biggest sign of pan abuse. I’ve heard some say the flaking bits are unsafe to consume and I’ve heard recent reports that say they aren’t harmful. But let’s face it. It’s made from chemicals. Why chance it? 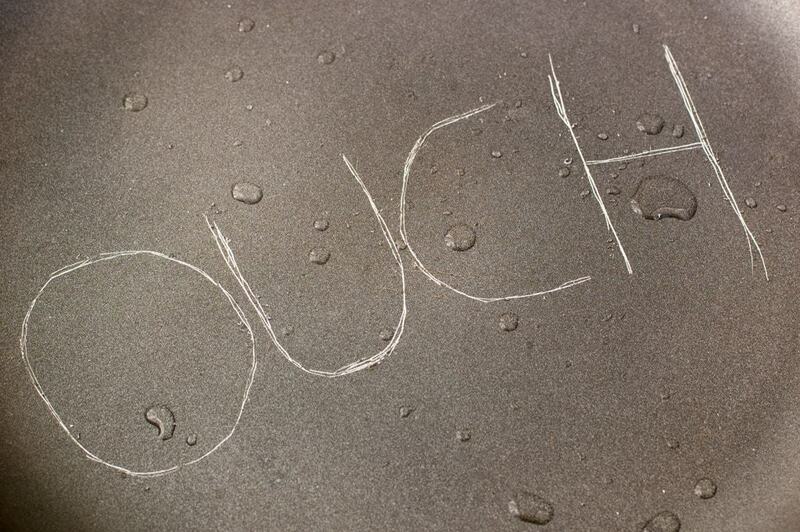 When deep scratches occur, the nonstick coating starts to flake and peel. A possible reason for the coating to flake could be high heat. Never use high heat on your nonstick cookware. Nonstick pans work best with low or medium heat. They are not meant for frying or boiling water. Do not put them under the broiler. Your nonstick pan might also be flaking because it has been deeply scratched and it will continue to peel. A recent inquiry with Calphalon about some light scratches on my pan resulted in this response: “Minor surface markings on nonstick are normal and to be expected under normal use and care.” They offered to inspect the pan under the warranty but I didn’t feel like going through the hooplah of shipping it to them for minor scratches. But this Snob disagrees that this is normal, unless their current products aren’t made the same way their pans used to be made. 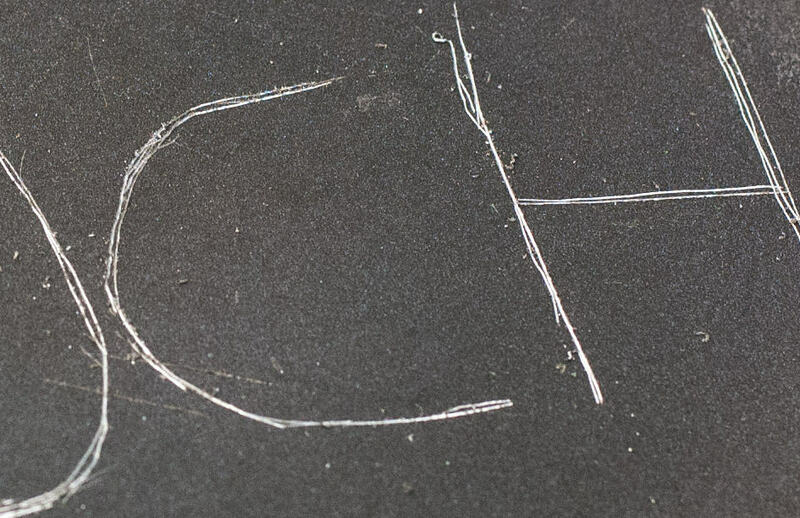 Because I’ve been noticing these surface scratches becoming more frequent. Another thing I’ve found that causes these “minor scratches” is cooking meat with bones in it (i.e. T-bone steaks or pork chops) and then moving the meat around in the pan. The bones can cause these minor scratches. That can’t always be helped, but it’s something you should be aware of. Don’t use Pam or other cooking sprays. They leave a residue on the pan and eventually the pan will start to stick. 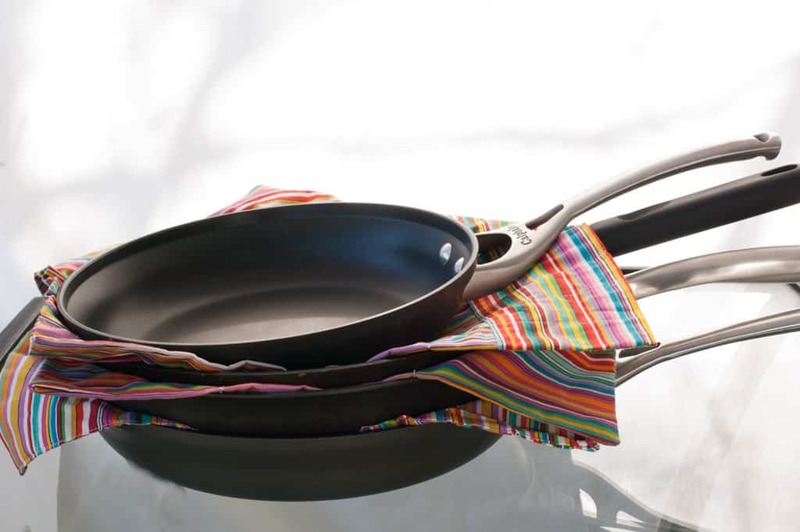 Lightly coat your nonstick pan with oil (olive, canola, vegetable, etc) or use butter. How do you know if your pan is warped? Place your pan on a flat surface. If it spins around easily or rocks back and forth, it’s warped. And if you have an electric ceramic stove top, you know how annoying it is to try to stir ingredients and have your pan spinning around on the cooktop. Harsh temperature changes can warp your pan. Don’t put hot pans in the sink with cold water. Don’t heat up your pans too quickly. If you want medium heat, put tempurature on low for a few minutes, then turn it up to medium so the pan can rise to the desired temperature slowly. Inexpensive pans can be made cheaply. I’ve had a few pans that were warped upon purchase. Use quality cookware. 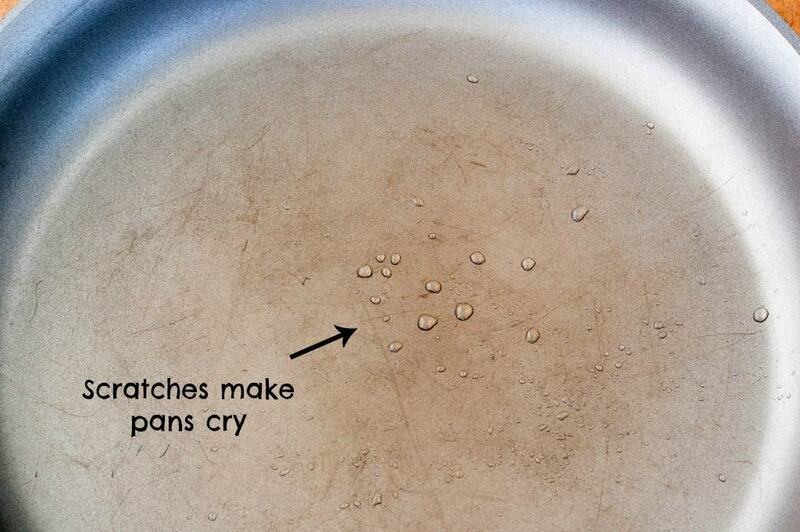 Over time, your pan might become slightly warped because of the temperature changes. But they shouldn’t be warped so much that they are rocking back and forth on your cooktop. Here is where I cause an upheaval in the nonstick community. Most home cooks know this: Never use metal utensils on your nonstick pans. No forks, knives, metal spatulas, whisks. You name it. The slightest bump on the bottom of the pan with metal will leave a scratch. The pan manufacturers advise to only use nylon and wooden utensils. But here is where I separate myself from the crowd (as any snob would). I have noticed that these nylon and wooden utensils can leave those tiny surface scratches (noted in #2 above) and over time, cause your pan to loose it’s nonstick coating. Why would pan companies like Calphalon tell you to use nylon or wooden utensils in their General Care tips? 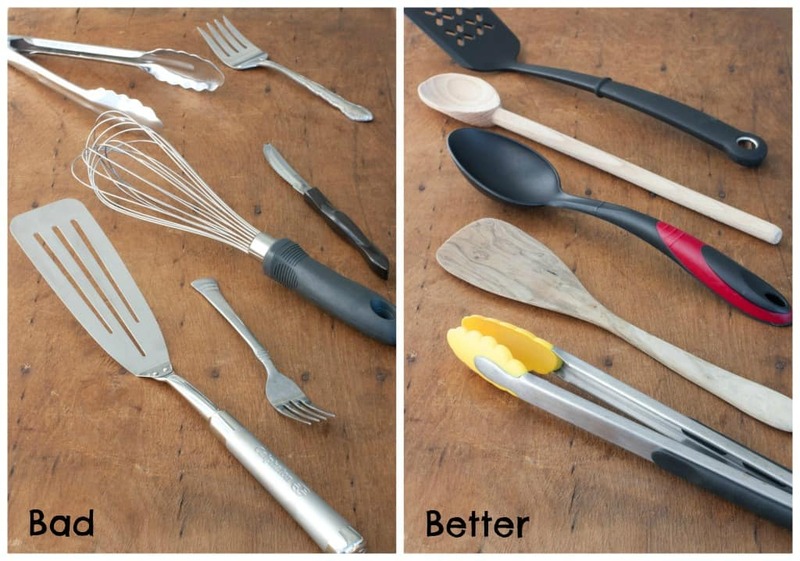 While it’s true that nylon and wood utensils are a much better alternative to metal, the pan companies are not accounting for the fact that they can’t predict how someone will use these nylon and wooden utensils. How much force is one person using versus another? Is someone scraping down the browned bits after browning something? Are they pressing hard? Are they lightly grazing the surface? Who knows, right? I’ve seen some people really go at it with their utensils as if they were taking out their aggression on the poor pan! I swear by silicone. It can handle high heat and it won’t scratch your pans, even if you press hard or aggressively. If you’ve never used a silicone utensil and would like to purchase one, you may wonder how you can tell if it’s silicone or nylon. Nylon, is a harder plastic. Silicone has a rubbery feel to it and is more flexible. This OXO Good Grips Silicone Spatula is my favorite spatula that I use on my Calphalon omelet pan. It’s perfect for scrambled eggs. I had to eventually buy an extra one so I would have two because I use it so much, one is always dirty! Another absolute favorite utensil of mine (which I received as a gift from my brother this past Christmas – thanks bro!) is the Williams-Sonoma Silicone Tools Set. These are incredible. The small spoon with the slots (which is my favorite in the set) can also be purchased separately here. What I love about this one is that it has a blunt end which is great for cutting things inside the pan. The quality is outstanding. I do not receive any commission on Williams-Sonoma products, I just love these so much, I just had to share with you! Can that nonstick pan that states that it’s “dishwasher safe” be put in the dishwasher? Sure. Go ahead. But you’re going to be buying new pans a lot sooner than if you hand wash it. And that’s what the pan companies are hoping for. I actually went in to Williams Sonoma because my Calphalon Unison pan had quite a few of these “minor scratches” on it. Don’t get me wrong, I love Calphalon and will be doing a review on some of their pans soon. But I wanted to find out more about this Unison line. They told me that Calphalon Unison was their top line and she confirmed that even though they are safe for the dishwasher, the pan will not last as long and it was best to hand wash them. This Snob will continue to hand wash my sweet, coveted Calphalon pans! Never use scratchy pads to clean your nonstick pans. Even the scratchy pads that say “non-scratch” are not good for your nonstick pans. I know you’re thinking “Jeez, she is a bigger snob than I thought”. I’m glad we’re getting to know each other. Just use the soft side of the sponge and stop being such a rebel. I’ve said it before and I’ll say it again. NEVER use high heat on your nonstick pans. NEVER use them to boil water. When a recipe calls for high heat, I always use medium to medium-high heat anyway because high on my stove seems to burn the food anyway. How you store your pans is just as important as how you cook with them. If possible, store them on a hanging rack. If you nest your pans like I do because you have limited storage space, you should be placing something in between your pans, such as a piece of material, soft placemat, or even a paper towel will do the trick. The bottom of one pan can scratch another’s interior. My mom made me some cute little quilted pieces just for this because heaven forbid The Kitchen Snob have her pans touching! This could happen for a combination of many of the reasons mentioned above: using cooking sprays, scratches over time appearing in the surface, or using high heat. If food is sticking to your pans, it’s time to replace it. Being a Kitchen Snob is tough sometimes. You gotta do crazy things like baby your pans. But it’s worth it! thought of all of that! I just LOVE those little striped pan protectors! Thanks! 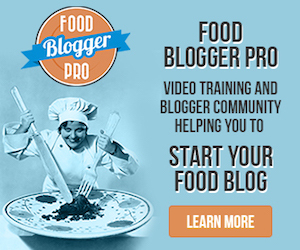 I hope this article will save many, many pans from future scratches. 😉 I know, I think my mom should sell those pan protectors! I’m such a bad girl with causing scratches and scraps in my cooking pans. 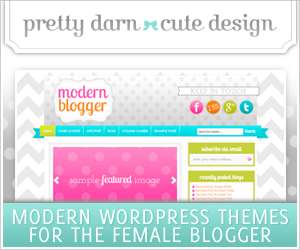 Tweeting this post out, great tips! My Calphalon Unison pans were used by guests and are scratched to the point that food sticks in the grooves. Should they be replaced. Hi Marilynne! Personally, I would replace them because the whole point of nonstick is so the food doesn’t stick 🙂 But I know they can be expensive. I’m not fond of the Unison line (mine have more scratches than my other Calphalon Contemporary ones) but the sales person at Williams-Sonoma told me the Unison was top of the line. I used to use wood but my boyfriend was too hard with them and scratched my good pans. Rather than ban him from cooking I got some silicone ones. I may have to switch to wood again because my silicone ones are absorbing nasty smells which is transferring to my food! Hi Ann. 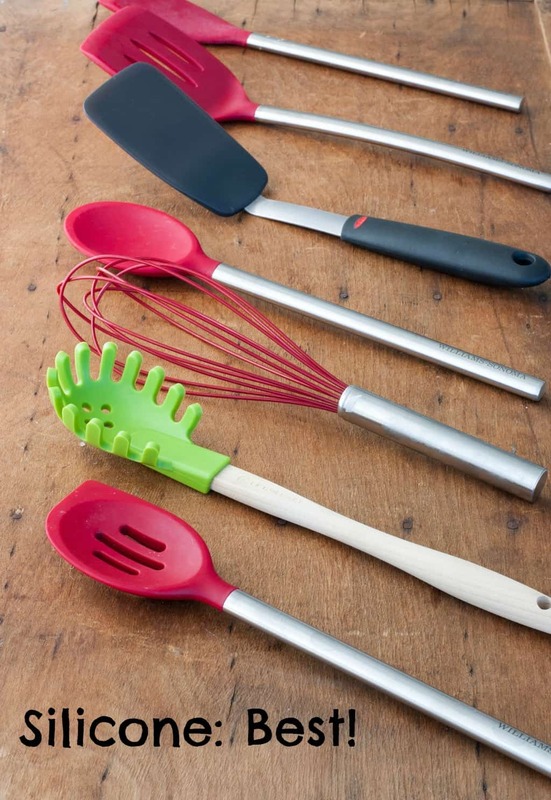 What brand of silicone utensils do you use? The smell thing is strange. I haven’t had any problems with my silicone absorbing smells. I did a little bit of research and found that if your utensils are 100% silicone, they should not absorb any smells. However, some manufacturers use fillers and therefore the silicone is not 100% and then they will absorb odors. Completely agree. Nylon will if pushed hard. Test it yourself near the top rim of the pan. Wood has hard silicon in it. Forgot about boiling water. Hope the pan survives. The Teflon companies don’t want to tell you the truth because then you will only buy one an instead of a set. I like carbon steel and stainless myself. Use a tittle oil and eggs wont stick. I understand the comment about high heat damaging the non-stick surface, which means to me, “Don’t turn the burner on high”, but I don’t understand the comment that says don’t use it boiling water or frying. If I can’t boil an egg or pasta, or fry an egg, what is the point of buying the cookware? I thought those were expected uses of a pot or pan. Also, a pot boiling water can’t reach an excessive temperature due to the fact that it contains a liquid which is dissipating the heat and has a maximum temperature that it can reach? Can you explain the comments?. Hi David. Thanks for your comment. You can fry an egg, as frying an egg wouldn’t require high heat. I do know people who boil water in their nonstick pots, but everything I’ve researched says it’s not recommended (mostly because it shortens the life of the pan). For boiling water, I recommend a stainless steel pot. For frying chicken and the like and high heat cooking, I recommend cast iron, enameled cast iron, or stainless steel. Honestly, the only time I actually put my burner on high is when I boil water. Everything else, gets a lower heat setting because I just end up burning the food. I had a friend who was doing something nice for me and she made me fried chicken in my nonstick omelette pan and it completely ruined it. I’m no scientific expert, of course, but that’s just my two cents based on my experience and research. I have used Caphalon pans over 20 years. I like their non stick pans. This article has super helpful info. I picked up some new tricks.